Sitting in the living room in front of the open balcony doors enjoying the warm breeze and sunshine I was hit with the urge to make a DIY lip color! 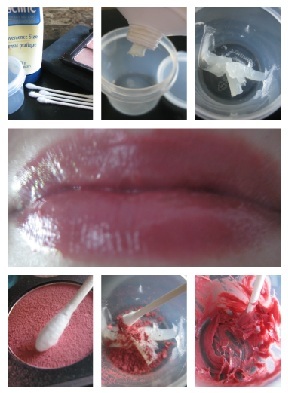 There are many DIY lip products that are time intensive and costly. I decided I wanted to do a very basic lip color – one that didn’t have me reaching for the credit card or leaving the house! If you are interested in more ‘advanced’ (for lack of better words) DIY lip products please let me know either by e-mail or by leaving a comment. I do have some planned for the future but I can bump them to an earlier date if requested, and your feedback is always appreciated. For this basic DIY lip color you are going to need Vaseline, Q-Tips (or something similar), a small airtight container (lip balm pot, contact case, etc…) and either eyeshadow or blush. Start by squeezing (or scooping) the desired amount of Vaseline into your container. As you can see, I only used a small amount – I was unable to find a smaller container. I used a Q-Tip to scrape the blush I chose for this, then I pushed the loose blush into the container with the Vaseline and stirred it for about a minute with the same Q-Tip. After stirring you may wish you add more blush (or eyeshadow) to get more color. I was happy with mine and skipped this step. This is a great way to put old eyeshadow and lip balm pots to use, as well as to use up old eye shadow and blush. I will definitely be repeating this DIY in the future. Next time I do this I would like to do more with it, whether it is in the lip color itself or the packaging and presentation. Be sure to check back to see what changes I make to this! If you give this DIY a try I would love to see or hear about your results so please feel free to leave a comment or send me an e-mail. As always thank you for reading. I hope you’ll spread the word and check back again soon! This entry was posted on July 9, 2013, 12:16 pm and is filed under DIY, DIY Beauty. You can follow any responses to this entry through RSS 2.0. You can leave a response, or trackback from your own site. I am definitely going to have to try making my own nail polish! I think a simple DIY is the way to go. But I’m just lazy like that. My favorite DIY projects tend to be the simple ones, and this is no exception. When they become too expensive, complicated or time consuming the appeal to DIY starts to disappear.